Tipra Nationalist Employee's Association held their first Noagang Divisional Conference at the auditorium of North Tripura Polytechnic College on Tuesday. 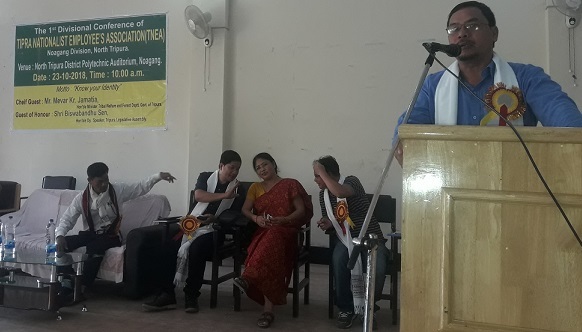 Tipra Nationalist Employee’s Association held their first Noagang Divisional Conference at the auditorium of North Tripura Polytechnic College on Tuesday. Addressing the programme, Minister Mewar Kumar Jamatia said that the tribal people were so far extorted during CPI-M regime in the last 25 years. “With the coalition government of BJP–IPFT coming to power the development of the tribal is the primary motive of the government,” he said. “The coalition government is looking forward for generating employment for the people. Within six months of coming to power, the coalition government has declared the 7th pay commission for the state government employees,” he added. He further said the main focus is to look forward to the strengthening of the tribal people and to recognize them for their existence. Tipra Nationalist Employee’s Association (TNEA) was formed with 35 employees on May 14, 2014. Deputy Speaker of Tripura Assembly Biswabandhu Sen along with others was present in the programme.